British toy manufacturer Character Options has revealed their first Dr. Who figures for 2009. The figures are based on the Cybermen. These figures also come with parts to form an extra character when all are collected. Collect all 4 figures to complete your Cyber Controller from “The Tomb of the Cybermen” (1967). 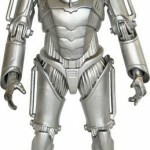 Cyber Leader from The Next Doctor (2008) + The Tomb of the Cybermen (1967) – Cyber Controller’s hip + right arm. The Tenth Planet (1966) + The Tomb of the Cybermen (1967) – Cyber Controller’s head. The Invasion (1968) + The Tomb of the Cybermen (1967) – Cyber Controller’s legs (Left & Right). The Tomb of the Cybermen (1967) + Tomb of the Cybermen (1967) – Cyber Controller’s middle + left arm. Click on the headline of the story for all the images. Underground Toys has debuted some new products that will be coming out in February 2009. 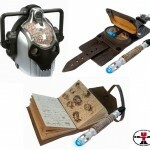 Captain Jack’s Vortex Manipulator & Mini Sonic Screwdriver – Both detailed items include light effects. The Vortex Manipulator is used by Captain Jack throughout the Doctor Who Series. It features a light, an adjustable strap and a removable cover. Cyber Leader’s Voice Changer Helmet – Yet to be seen in the 2008 Christmas Special The Next Doctor”. Features speech, light and sound effects. The Journal of Impossible Things – This book and pen set contains an A5 book with extremely detailed printed pages. Blank pages are also available for use with the included miniature Sonic Screwdriver pen.